A desire to understand the inner workings of the peer-review system has led a group of early career researchers to publish a new guide on the topic. Members of Sense About Science’s Voice of Young Science (VoYS) network, an active group of early career researchers who stand up for science in public debates and inspire their peers to do the same, were behind the guide. They were keen to discover how to get involved in peer review and what is being done to address some of the criticisms of the system, such as bias from reviewers. So, armed with a collection of concerns raised by their peers, they set off to interview scientists, journal editors, grant body representatives, patient group workers and journalists worldwide. The end result is the new guide, Peer review: the nuts and bolts, which is aimed at early career researchers. 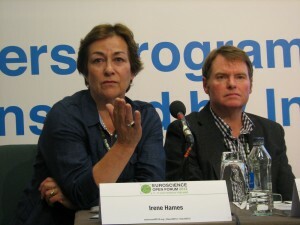 It received its official launch at the EuroScience Open Forum (ESOF) in Dublin this July. In 2009, Sense About Science partnered with Elsevier to conduct one of the largest surveys of international authors and reviewers which highlighted how dedicated the scientific community is to peer review. 90% of respondents review articles because they like playing their part as a member of the academic community; 85% enjoy seeing papers and being able to improve them; and 91% believe their own last paper was improved through the peer-review process. In writing the guide, the authors of Peer review: the nuts and bolts have not avoided criticisms of the peer-review process. They have asked journal editors and reviewers some challenging questions about scientific fraud and plagiarism going undetected; issues of trust and bias; ground-breaking research taking years to publish and the system benefiting a closed group of scientists. What became clear was that early career researchers are frustrated by the lack of formal recognition for reviewing. With so many pressures to secure grant funding and publish research, there is a risk reviewing will become marginalised and inevitably inconsistent and shoddy. Reviewing is currently not included in the Research Excellence Framework (REF) in the UK (the new system for the allocation of funding to higher education institutes). Members of the VoYS network decided to do something about this and wrote an open letter to Sir Alan Langlands, the Chief Executive of the Higher Education Funding Council of England, calling for formal recognition of reviewing in the REF. In the letter, the early career researchers told Sir Alan: “Recognising reviewing as part of the REF would ensure that it is prioritised and safeguarded by university departments, [...] and approached professionally and seriously, enabling senior researchers to spend time mentoring early career researchers like ourselves in these activities.” A copy of their letter can be found on the Sense About Science website. 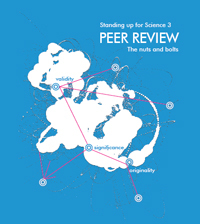 Peer review: the nuts and bolts is available to download from the Sense About Science website. For hard copies, please send requests to publications@senseaboutscience.org.